Pioneer is destined to make a splash with its first high-resolution digital audio (DAP), the XDP-100R ($699 and available at Amazon). While it wasn’t the sweetest sounding player in our roundup, its slick user interface, rich feature set (including upcoming support for MQA audio files), and overall great sound made this the player to beat. Its only major downsides are lackluster MacOS support and its bulky size. The Pioneer XDP-100R is basically the merger of a 4.7-inch Android mobile device with the guts of a high-res audio player. Thankfully, Pioneer’s design didn't come out looking like Frankenstein's monster. It's not as sleek as it could have been, but its machined-aluminum exterior is beautiful and rigid. On startup, the Pioneer XDP-100R let’s you know it’s powered by an Andriod-based OS. There's 2GB of RAM under the hood, complementing 32GB of flash memory for storing music. This is augmented by a pair of microSD card slots capable of storing an additional 200GB each. As we’ve noted elsewhere, be sure you use high-quality, name-brand microSD cards, as some high-res DAP vendors have apparently run into issues with lesser-quality cards of that capacity. The Pioneer sports a single ESS Sabre ES9018K2M DAC (digital-to-analog converter). Amplification comes courtesy of ESS's Sabre 9601K headphone amp. Pioneer physically separated the DAC/Amp circuit board from the main board to minimize noise by isolating the two components. Pioneer also fitted the DAC/Amp board with dedicated capacitors to for a clean, closed-loop design. The Pioneer’s has an understated volume control compared to some other high-res audio players. For whatever reason, it seems most high-res DAP designers have singled out the volume-control knob as worthy of aesthetic flair. Pioneer’s team ignored that trend. The XDP-100R's volume control is actually understated. It's also on the left side. While that may be a blessing for left-handed users, it took time for me to grow accustomed to adjusting the volume. Also unlike other high-res DAPs in this roundup: you can adjust this player’s touchscreen to control the volume—but only after you’ve called it up using the physical volume wheel. Removable metal bumpers protect the player’s top and bottom ports. They add to the height of the player, but don’t alter your grip or feel. Given that the player is so physically large, they didn’t bother me that much—especially the way the bottom bumper is tapered. I occasionally put players in my back pocket, so I liked the top bumper rail, which provides at least some protection against bending or snapping a 3.5mm headphone plug. The volume level was clear and intuitive. Once active by turning the volume wheel, you could adjust it manually from the capacitive touch controls on the screen. The XDP-100R comes with a vast set of features. You get 802.11ac Wi-Fi and Bluetooth with aptX for starters. There are three gain settings and an 11-band equalizer with five presets and an additional manual setting. You can choose from three digital filters, up-sample audio to 192kHz, fine-tune the conversion of DSD to PCM, and (if you connect the Pioneer to an external DoP-compatible USB DAC) you can even convert PCM audio to DSD before playback (DoP is an acronym for Digital over PCM). The comprehensive user manual and product specs page make for excellent bedtime reading. Unlike its competitors, and true to its Android roots, Pioneer's player lets you install alternative music-player apps from the Google Play store. There's the default app, called simply “Music,” or you can use the Onkyo Music app, which lets you purchase CD-quality or high-res music from the Onkyo Music Store (Onkyo is Pioneer's parent company). The full range of Android apps and services are also available. The Pioneer XDP-100R offered a dizzying set of settings and customization options. Speaking of alternatives, the XDP-100R might be the first high-res DAP to support native playback of MQA (Master Quality Authenticated) audio files. I say it "might" be the first because while Pioneer has committed to supporting MQA, the firmware to enable this feature is not yet available. This is a big deal because MQA files have an embedded digital fingerprint certifying that the recording artist, recording engineer, or producer attests that the music was sourced from the original studio-master recording. That means the file you’re listening to has been sourced form the highest-quality recording available. Now that doesn't necessarily mean that the track was recorded in high resolution, because that technology might not have been available in the studio at the time; but it does mean that you won't find a higher-quality track anywhere else. Unlike the Astell&Kern AK Jr and Questyle QP1R, the Pioneer’s user interface is an absolute joy to use. First off, it's fast: No lag, no delays. Information is consistently displayed in a clear and fairly legible manner at all times. This was also the only player where I could search for music. I have a huge music library and used the search feature all the time. Compared to the Questyle QP1R (right), the Pioneer XDP-100R’s screen showed more information that was far more legible. The Music app’s interface gives you the full album’s tracks if you swipe down, and you have access to the 11-band equalizer if you swipe up. Navigating between albums, songs, artists, and storage devices was a piece of cake. The only unintuitive and clunky thing was creating playlists. I found the Onkyo Music app much better for that task. Custom playlists aside, there were some quirks too. Just about every single customized Android device that I’ve come across has some sort of quirk between the system settings and its apps. I didn’t find anything major but the Pioneer follows suit. For example, when I enabled accessibility and increased the system font size, it worked on just about everything except on the native Music app. Increasing the system font size made no difference whatsoever. When I went to the included Onkyo Music app, however, font sizes changed according to my system preferences. While the Pioneer is the best player for people who need larger type, there’s still room for improvement. The Pioneer XDP-100R was the only player in our roundup that doesn’t show up as an external disk for drag-and-drop file transfers. Instead, you must use the company’s X-DAP Link software to transfer files. The software is great and allows you to synchronize folders on a Windows PC, but I ran into a problem: There's no version of the software for the Mac. If I dragged and dropped files from a Mac to the microSD card on the XDP-100R, I’d see all the invisible UNIX system files—including Spotlight index and system trash folders. Pioneer told me that they are working on a Mac version; in the meantime, Mac users will need to download the Android file transfer utility to copy files between your computer and the player’s internal storage. You can grab that here. Well, what about microSD cards? That should be OK, right? Not so fast! If you’re dragging and dropping files from a Mac onto a microSD card, the default Music app will display every single file on the microSD card—even hidden system files that the Mac writes to the card, such as the Apple Spotlight indexes. Dragging and dropping songs from a Mac to the microSD card revealed system-level files that should have remained hidden. This is a very big problem. Not only do you see irrelevant folders, but there were also instances where hidden files with the same names as my music files showed up (since these system files start with a period, they appear first in your track list, but nothing happens when you click on them. Each of the music players I surveyed had a decidedly different sonic signature. While the Questyle QP1R was lush and euphonic, the Pioneer tended to lean towards an analytical, matter-of-fact presentation. That’s not a criticism and I don’t mean “analytical” in the pejorative sense. With any of these players, it’s a matter of taste. I felt that B&W’s P7 headphones were a great sonic match for the Pioneer; in fact, through the P7s, I never got a sense that the XDP-100R tried to romanticize its sonic presentation (as some other sonic flavors tend to do) the Pioneer let me see deep into the details and complex layers of every track. For example, on the 96kHz ALAC version of Alison Krauss and Robert Plant’s “Please Read the Letter,” from Raising Sand, I could readily make out the fine texture of each drum strike and the nuanced decay of plucked guitar strings. The top and bottom bumpers are removeable with a small Phillips screwdriver. I liked having the extra protection of the top bumper to prevent the 3.5mm plug from being bent or snapped. When Plant and Krauss come together for the refrain, vocals were clear and clean. I could listen to the two of them harmonize and then in an instant shift my focus to either one or the other and make out audible gestures from from each one’s vocals. Just as with live music, I had the ability to zoom in or pull back by audible lens and experience the song any way I wanted. If you can’t get strings right, then you have no business reproducing music. Thankfully the Pioneer didn’t disappoint. The fiddle solo about 3:00 minutes into “Please Read the Letter” was smooth without a hint of harshness anywhere. The guitar lines from the 48kHz FLAC version of Patricia Barber’s “A Taste of Honey” from Cafe Blue were, um, sweet. And Barber’s vocals were rendered with full body. Pink Floyd’s Dark Side of the Moon and Wish You Were Here, Led Zeppelin II, the Beatles' Abbey Road, Eric Clapton’s Slowhand, and Steely Dan’s Gaucho headline a long list of high-res music albums I put to the test. Through them all, the XDP-100R displayed exceptional musicality. I was able to see detailed information about every song I played. Swiping down revealed the album song list and swiping up revealed the EQ settings. I also downloaded high-res music versions of Star Wars: The Force Awakens and The Dark Knight Rises (among others) to compare them to their iTunes AAC counterparts. Comparatively speaking, I felt that the high-res music versions conveyed greater midrange clarity and better low-end dynamics than their lossy-encoded counterparts. All in all, no matter the genre or test, the Pioneer passed with flying colors. In the two plus months that I lived with these three high-res players, I found myself repeatedly turning to the XDP-100R. Even though it was the largest of the bunch, I preferred taking it with me on the go and using it at every turn. 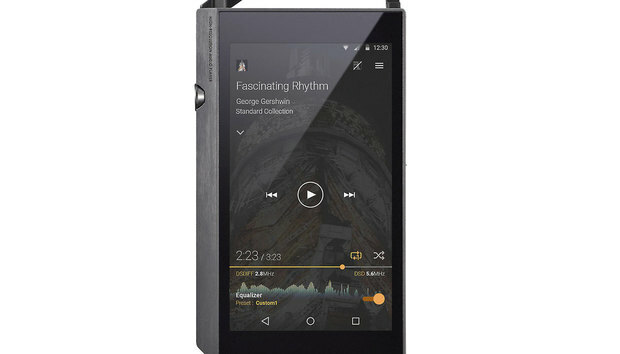 It offered me none of the frustrations I experienced with both the Questyle QP1R or Astell&Kern AK Jr. While the Pioneer wasn’t the sweetest-sounding player (that title belongs to the Questyle), that doesn’t mean it wasn’t a thoroughly satisfying one. Pioneer’s XDP-100R is a knockout. It combines performance, features, and a slick user interface. Add to all that, native MQA playback and MacOS support just around the corner and we’re crowning the XDP-100R as our undisputed choice for top high-res audio player. Highly recommended.